Club Penguin Cheats by Mimo777 Club Penguin Cheats by Mimo777: Club Penguin Message From Director-Nobody's Perfect! 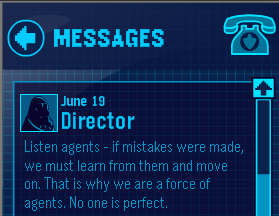 Club Penguin Message From Director-Nobody's Perfect! Director has sent us a new Club Penguin message! Yeah Mimo you know better than that! XD wow ha ha great post and ur the only blog i visit GO MIMO!!! Mimo? Why R U singing Hannah Montana? huh? how is mimo singing hannah montana? sorry i know who she is but i wanna so how is he singing her song? I ROFLed at you singing hannah montana! It was from her song "Nobody's Perfect"
''Club Miley Penguin'' where the motto is if you do it wrong let all the team clean up then apologise. I'm just wondering...when will you put up the comment tracker for Cadence and the Penguin Band? 1) Miley - Whoops... I mean 'Hannah' has inspiring songs; Don't dis her! 2) It's like Director is telling off the agents!! EG: Rookie, JPG, Gary. 3) My pet turtle actually doesn't eat toast, and neither do my socks. Hannah Montana has a song calld "Nobody's Perfect" And Mimo used some lines from the lyrics in his post. Club Penguin was HACKED ! Is anyone getting a fake site when they try to log in to CP? I get a dude playing golf and it says domain. Is this happening to anyone else. Mimo please post need help. Mimo777, this is super weird. Clubpenguin forgot to renew the site! I cant go on! Mimo club penguin is down i think because when people try to go on the website they get directed to this other website that is just full of ads. Mimo... Club Penguin is really weird lately... the page. I can't play it and the page is about golf! why were you singing to Hannah Montana. Nice post! I would like to go on and see for my self, but it looks like cp hasn't renewed their domain name! Does anyone else get related links when they go to play.clubpenguin.com? lol ur singing Hannah Montana! lol ur a great singer mimo!!! XD GO MIMO!!! oh no! is it my computer or are you guys seeing the club penguin is not working! LOL! Guys, it's just a joke. I guess mimo is in the groove of hannah montana now. she makes totally DIFFERENT songs now. why does that happen to all stars like this?! they are kid singers then they switch to teen singers. WHY?! Hannah Montana music is dead now!Bye Bye Too Lamo For the Nato! !